Korea Newswire has the largest press release distribution network and a robust database of Korean journalists and bloggers to deliver your news effectively. Depending on how widely you distribute your news release, we provide various services including Basic, Standard, Premium and Global. Press releases are categorized into 143 industry sectors and distributed via MY news e-mails sent to subscribing members four times a day. The total number of members is more than 62,000, including 16,000 journalists. 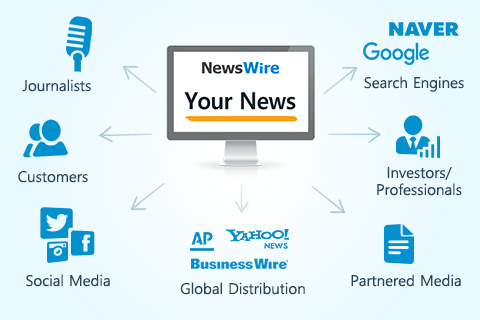 Korea Newswire built the industry’s largest distribution network to share your news with your audience. Our distribution channels include a database of 32,000 journalists divided into 290 industry sectors and a newsroom distribution system for 2,600 media outlets and so on. Press releases placed on Korea Newswire are sent to web pages or news on the major search engines such as Google, Naver, Zum and Twitter. We also offer social media sharing feature via Facebook, Kakao, and more. In partnership with Businesswire, we distribute press releases to 89,000 media outlets in 200 countries. Press releases are sent and placed as syndication on 158 partnered news sites in a real time. Press releases are distributed to 25 major securities firms and are read by investors. Coverage report is provided to the service users after the distribution of the press release by Korea Newswire. Our detailed report helps you track distribution results.